Workshops – Conscious Education Consulting, LLC. Conscious Education Consulting workshops are reflective, informative, engaging, and interactive! 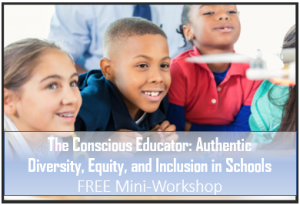 Designed to help all teachers and schools grow their cultural competence in working with culturally, linguistically, economically, religiously diverse, and differently abled students and their families. Check out these upcoming workshops! Check out this FREE mini-workshop event!